On Friday 26th January 2018, ERP hosted the Perez family from Epi-Use Argentina, whose visit among other things was to donate shoes from the All Walks of Life Project and clothes to the orphans at the Bothlokwa Bja Ngwana Safe Centre and have a firsthand experience of ERP’s interventions in the Dinokeng Game Reserve and the adjacent community of Kekana Gardens area. The Perez family were accompanied by the ERP staff, some members from EPI-USE (Pretoria) and G3G (part of Groupelephant.com) as they set off for Kekana Gardens in the morning. First stop for them was the Pfaranani Skills Training Centre that ERP currently manages in the community. They were taken for a tour of the centre and were also given orientation and background of the community by South African National Civic Organisation’s (SANCO) Chairperson for Ward 73. What was put into context were the social challenges faced by the community and how ERP is working towards resolving some of these challenges through the different interventions we are currently running. G3G was also able to hand over to SANCO 20 pairs of adult shoes that they donated to the community. These have been earmarked for the old age home. 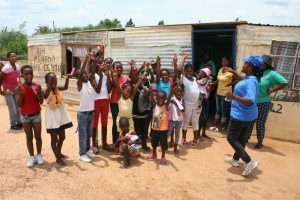 After the tour of the training centre, we headed to Bothlokwa Bja Ngwana Safe Centre, where the Perez family met with the management of the centre, and were also able to handover the shoes and clothes to about 20 children that were present at the time. Those who were absent had their gifts kept for them, and the management at the centre agreed that all the clothes would be distributed when all the children are present. It was heartwarming to also see the Perez’s young daughter helping with the handing over of the shoes and interacting with the other children at the centre. ERP brought along 30 Colgate oral hygiene kits which were distributed to all the children present. Having spent time at the centre, we then proceeded to go through to the Seikhokotlelo Old Age Home where the Perez family got time to interact with the management there as they were taken on a tour around the place. Some of the most pressing needs faced by the home were discussed, including the fact that the inspector from the Department of Social Development had come through and asked the centre to shut down because of minor technical requirements. To this end, the EPI-USE and G3G staff present resolved that they would be willing to assist the centre where ever they can, through internally fundraising in order to meet these needs, thereby further adding value to their mantra of Going Beyond Corporate Purpose. The last task of the day was taking the Perez family into Dinokeng Game Reserve. This was not only for their game drive, but also aided in showing the direct nexus existing between the conservation of Elephants and Rhinos through the alleviation of poverty for People and communities living next to game reserves, which essentially is the ERP mission. A special thank you goes out to the Perez family for making time to come through and personally share with the Kekana Gardens community. We also extend our heartfelt thank you to the EPI-USE and G3G members of staff that came through for the day.